Excellent American-style dining in front of the fireplace or out on the patio of the historic Lumberyard building! This Laguna Beach restaurant serves lunch, dinner, and a great Sunday Brunch featuring favorites including steaks, ribs, seafood, and chicken! LATimes.com - One lucky LA Times reader compels the Lumberyard Restaurant in Laguna Beach to share their recipe for Roasted Tomato Bisque! 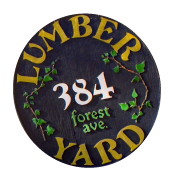 Every Monday through Friday from 3:30pm to 6:30pm, the Lumberyard offers discount appetizers and drinks in the Lumberyard Bar! Lumberyard also hosts Sunday Brunch from 11:00am to 3:00pm featuring the "Build Your Own Bloody Mary Bar"!! Return from The Lumberyard Restaurant to the Laguna Beach Restaurants Page. Return to Laguna Beach Info - Home Page.